Today was a day of sunshine and blue skies. It felt more like spring than the middle of winter. Even the birdsongs were reminiscent of warmer weather. I decided to extend my walk this morning and I came across some beauty berries at the trunk of a hickory. I had to scoot through some underbrush to get a decent shot. Later, Jilda and I did a few remaining housekeeping chores to get ready for our company this afternoon. Around 1 p.m. I stepped out onto the deck and sat for a long while. After the coldest weather in nineteen years, the sun felt good on my face. We both realized before our songwriting buddies came that we hadn't written a new song this month. We'd told them all last meeting that we planned to have a new one and I really wanted to have one to play. I keep a list of melody ideas on my iPhone, so I started clicking through them to see if anything might work. Jilda heard one I'd recorded a few years ago and liked it. Less than an hour later, we completed a song. Usually after we finish a new song I immediately start picking it apart trying to eliminate weak lines and tweaking the melody. But when we finished this one, we both high-fived. Even after playing it in front of the group, I still think it's one of the strongest songs we've written in some time. We plan to lay down a decent recording of it within the next few weeks and when we do I'll post it. I hope you all have a fun and productive week. I KNEW you'd become creative again soon!! True creativity cannot be stilled...I can't wait to hear the new song! Love the fact that you creatively brought the song together in no time! Enjoy your company this afternoon. May that warm sunshine continue to shine upon you both. 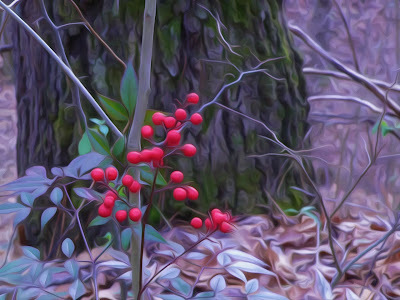 Love the photo of the berries at the base of the tree. What a lovely pop of color in your winter wonderland. The berries against your swirling background were exquisite. A song writer as well? Man of many talents. Sounds like the beautiful weather influenced the song...it came straight from your heart! Wow - isn't it just a wonderful little miracle when things go together so easily? They don't always (as you know) so savor the moment! You must have been truly inspired! Nice photography today too. You have a creative soul and that will always shine through. What a great gift, when you least expect it. The gift of creativity... and don't you just love it when it all comes together just like that. Maybe those beautiful berries are magic.he he.